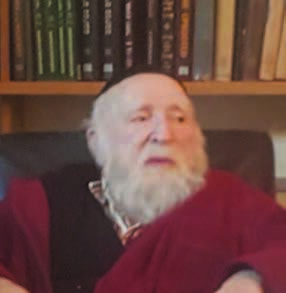 Rabbi Yehoshua Eibshitz, z”l, a well-known Holocaust historian and published author, passed away today in Yerushalayim at the age of 103. Reb Yehoshua was born in Poland in 1916 and was very close to Harav Henoch Gad of Pilitz, zy”a. In his younger years he learned in Piotrkov under Harav Shimon Uberband, zt”l, and under Harav Meir Shapiro, zt”l, who was Rav in the city at the time before moving to Lublin. He was also very close to many other Gedolim and Rabbanim in pre-war Poland. Rabbi Eibshitz was a renowned talmid chacham with a photographic memory. He went through the horrors of the Holocaust and moved to America after the war. A few years later he moved to Eretz Yisrael, to the town of Kfar Ata, where he became close to Harav Mendelsohn, zt”l, of Komemius. He later moved to Yerushalayim and dedicated his life to writing and to educating the younger generation on the Holocaust. About a year ago he lost his sight but was able to daven word for word from his phenomenal memory. Rabbi Eibshitz was brought to kevurah on Har Hazeisim . As he did not leave behind any children, it is requested that Mishnayos be learned for Reb Yisroel Yehoshua ben Reb Chaim Elazar, z”l, on his behalf.